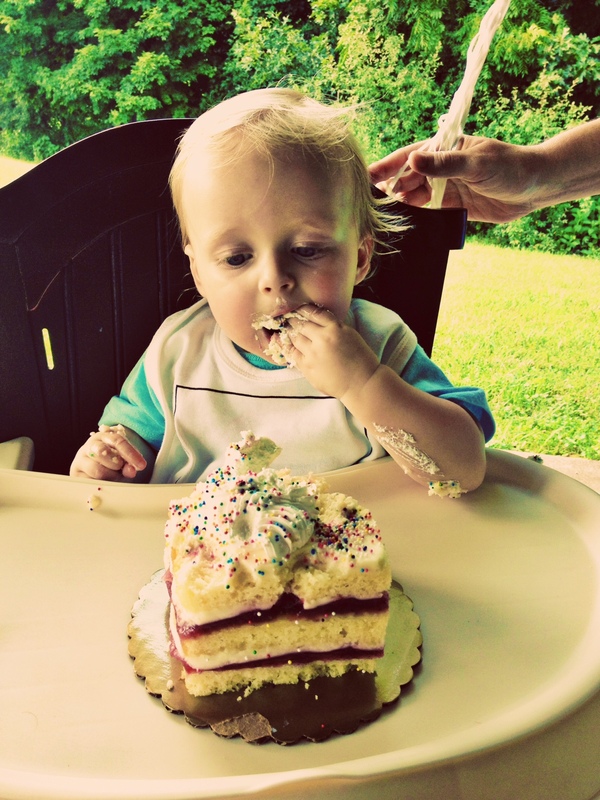 Ezra, today you are one year old. And it’s been a wonderful year full of blessing and joy. You had the distinct honor of being the second child. This will most likely make it slightly easier for you to grasp essential lessons like: all that cake isn’t for you, all those toys aren’t for you, all mom and dad’s attention isn’t for you, all that cake isn’t for you, be patient, the world doesn’t revolve around you, all that cake isn’t for you, and comparison is always a loosing game to play when determining your self worth. You’re not as fast as your brother (yet), but that doesn’t define you. Your brother doesn’t have that quickness to smile like you do, but that doesn’t define you either. In fact you’re not even defined by the fact that you are the second child. You’re not defined by height, or weight, or skill sets, or the unbelievable rate at which you just ate that hard-boiled egg. You’re not defined by birth order, or by your parents, or by how you measure up to your siblings, or your friends, or your playmates, or any other mere human. You see, you’re a soul. And yes, that soul is surrounded by skin, and bones, and vital organs, and muscles, and skill sets, and lineage, and a thousand other things, and by that contagious smile, and that intoxicating laugh of yours. All these things display a little bit about who you are and tell a little bit of the story of your life. But you are not any of those things. You are a soul. And that means that you are only defined by one thing. You are only identified by one thing: your relationship with God in Jesus Christ. And that makes things pretty simple (not the “politically correct” kind of simple or the “life is easy” kind of simple, but instead it makes things the “lines are painted pretty clear” kind of simple). Outside of Christ you have nothing lasting or meaningful. Outside of Christ, this significantly less than perfect life will be your best life now and then eternal, literal, physical, hell. But in Christ, you can have the inheritance of everything that is God’s: resurrection power, eternal joy, and unmatched satisfaction and eons more extrordinary things the earth cannot contain and best of all, in Christ, you get God, the greatest treasure the universe will ever know. And that’s why i pray for you every single day and that’s why I speak to you and sing to you about Jesus! Because Jesus is enough and everything else in this world is less than enough. Way way less than enough. Thank you for Ezra Charles Boekell! For his quick smile, and room filling laugh and bright eyes, and contagious joy! Please save Ezra! Open his eyes to the reality that You alone are the only source of real joy, and true satisfaction, and eternal life. Regenerate his depraved heart of stone so that he cannot resist turning to You. i humbly and boldly ask, that he will trust the finished work of Christ on the cross, alone and nothing else, for salvation. That he will be justified, by Your grace. That You will begin the lifetime miracle of sanctification in his life, by Your grace. And that one day whether he is young or old, near or far from “home”, he will die with his boots on serving You and be glorified, by Your eternal grace! Make us men who are tough and tender. Tough to do right, fight evil, and work hard no matter what the cost and tender to love those who are poor and weak and hurting. Tough in our resolve to follow You and tender in our love for and sensitivity to You. And, even if it is to his death, send Ezra headlong into the darkest and saddest places, with the joyful heart that you have given him, filled to overflowing with the Gospel. And leave hearts turned to Jesus, and sadness turned to smiles, and tears turned to laughter, and broken hearts turned to dancing feet in the wake of his path. All for the glory of God, and the fame of Christ, and the joy of all peoples, and by the power of the Holy Spirit. Amen. I love you, Ezra Charles Boekell! And finally, a song for you now and for all your days. It expresses my heart beat for you more succinctly and poetically than i can. “You’ll Find Your Way” by Andrew Peterson from Grant Howard on Vimeo.